The 24th International Detroit Auto Show for 2012 winds to a close this weekend so before it's gone till next year let's review some of the highlights at the event for those still waiting to go, and those unable to attend. Special thanks again to our resident reporter Steve Cypher for all the information and photographs he was able to bring back with him. 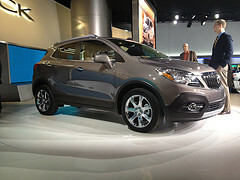 You can find all the photos in our 2012 Detroit Auto Show images Flickr gallery. And to get the latest news before we post it, give him a follow @sdcypher on twitter. 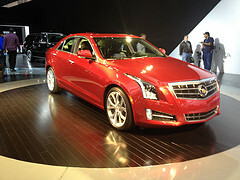 The latest new cars for sale at the 2012 Detroit Auto Show General Motors exhibit this year was the 2012 Cadillac ATS, Buick Encore, and tweaked out 2013 Sonic RS. Concept cars this year were the Code 130R and Tru 140s which promised hints of much more rounded designs to come. The Cadillac ATS is the new entry level luxury car for GM, while the 2013 Buick Encore promised Enclave like styling in a tighter package. 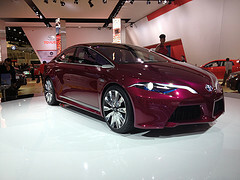 For all the recent trouble Toyota has endured as of late, the 2012 Detroit Auto show Toyota exhibit was a full booth. 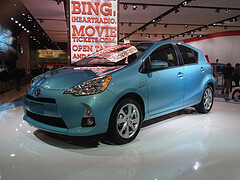 The highly anticipated Toyota Prius c was there, as was the Toyota NS4 dedicated plug-in concept car. The front hood dominates the car like the beak of a bird of prey. A few more futuristic concept cars were on display including the oddly faced Toyota FCV-R concept and the futuristic Toyota Fun-Vii. Check them out with the rest of our 2012 Detroit Auto Show Toyota cars to see for yourself. 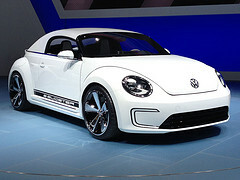 Some great pictures out of the Volkswagen exhibit this year, you can see some of the official press photos in Steve's 2012 Detroit Auto Show Volkswagen guide, though if you want our pictures head on down to the 2012 Detroit Auto Show Volkswagen cars section. 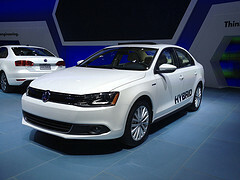 It was definitely a green event, with the 2013 Jetta Hybrid and Volkswagen E-bugster electric concept car on display. Both mark steps by Volkswagen away from its traditional diesel lineup to a more diversified green car portfolio. Remember, the show ends this weekend, so time to attend is running out. Next week we'll wrap up our coverage including the latest from Acura, Honda, and hopefully some video of the show.